Custom Printed Ella Waterproof Fabric. Waterproof Fabric Printing. Ella is in our water-resistant fabric print family. Our printed waterproof fabric makes this Ella version extremely lightweight. Despite being light, it is extremely tough. We use it for umbrella canopies, but the flexibility lends itself to a variety of other projects. 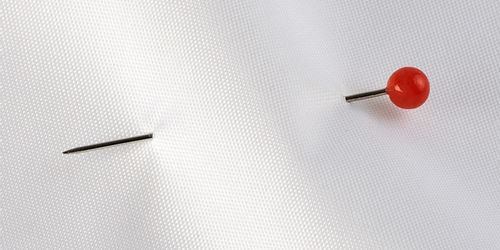 Ella is a poly-based, tightly woven material, which is solid but not completely opaque. There is some minor elasticity in our Lightweight Waterproof fabric, allowing some give. We are so happy to welcome Ella to our custom waterproof fabric family. This sleek and smooth addition is unique and very useful. You know you are going to stay dry when under your print Ella Waterproof fabric. There is a clear difference between the back and front faces of this fabric. The front texture is even and smooth, whereas the back is slightly more rubbery, with a plastic feel. As this is a fabric often used for the making of garments, it has a feel to it, which is cool to the touch. The waterproof coating gives the fabric a stiff handle, allowing it to drape in quite a structured way, maintaining its shape once manipulated. 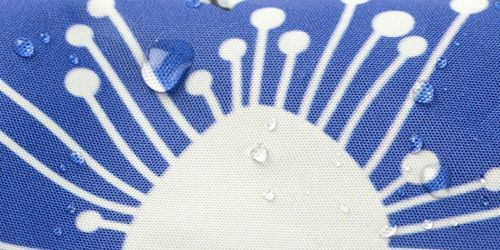 With a clean white base to the color of the fabric, which, paired with the color intensity produced in our prints and the slight sheen to custom Ella Waterproof fabric, produces a finish which is highly detailed. Prints are very sharp and precise. If you would like to see pattern printing for each fabric up close, please order a swatch pack and compare the samples in further detail. Because this fabric is strong, lightweight and water resistant, it makes it ideal for use in light garments e.g. wind breakers and applications such as umbrellas. It is great for waterproof linings but not for exercise clothing, as it’s not a highly breathable fabric. Great service on banner The website was good. The design tools were great. The person I spoke with on the phone was very knowledgeable and helpful. Price was good. Delivery was quick. Excellent First Print Had a really great experience using Contrado to design and print my first custom pattern. Really easy interface for uploading and arranging the print, the fabric selection options were varied and good quality, and it took no time at all to receive my fabric. I spoke to the online customer service reps 3 separate times to ask questions and they were all friendly and informative. Can’t really ask for more. Is this the best material for umbrellas? 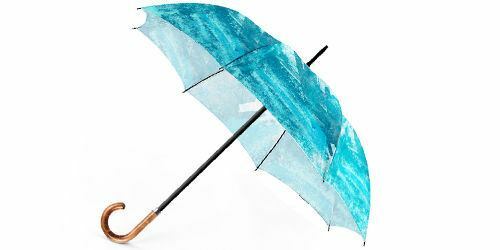 We do have a few waterproof fabrics but this is the most compatible with an umbrella frame, as it is light but still stretches slightly to perfectly fit the taut structure of an umbrella frame. What is the difference between this and Linden Waterproof? Linden is thick and heavy with no stretch,whereas the Ella Waterproof fabric is almost half the weight and has a slightly finer weave, which makes the surface less textured. Is the Ella Waterproof suitable for clothing? It may be the lightest of the waterproof options, however, it's not a breathable material so we would advise the Breathable Waterproof if you were looking to make some wearable.